Last week I saw a little machine that makes spaghetti noodles out of veggies called a Spiralizer . I ordered it from Amazon along with the Braggs nutritional yeast and Braggs Amino Acid. Before using my spiralizer I did a search on Youtube and found my favorite gardening guy doing a demo, John Kohler. The spiralizer is extremely easy to use but there are a few hints that help you get the best results. This dish is absolutely yummy! Do you have a favorite sauce to put on your veggie spaghetti? 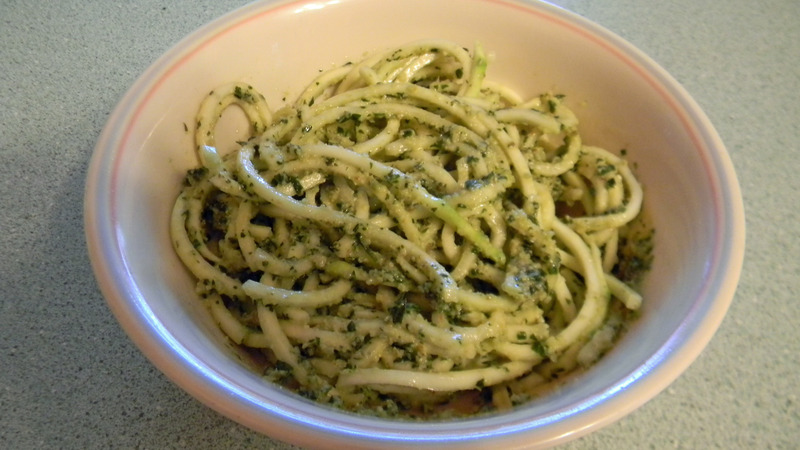 This entry was posted in Food and Drink, Posts, Raw Vegan and tagged Raw Vegan Basil Walnut Pesto, Raw Zuchinni spaghetti, Spiralizer. Bookmark the permalink.